I love this time of year: the winter behind us, the start of the new flat season. Jump racing is a great spectacle but I prefer to bet on the flat. Consequently during the dark months I bet mainly on the all-weather although inevitably I find myself getting involved with the Cheltenham Festival and the Grand National. Unlike 2016, Cheltenham had been profitable, thanks mainly to a chunky bet on the Irish to train most winners. This gave me an “interest” in most races and cut down the race by race temptations as a result! We were in Dublin the same weekend last year. When we reached Gowran Park on the Saturday it was snowing. 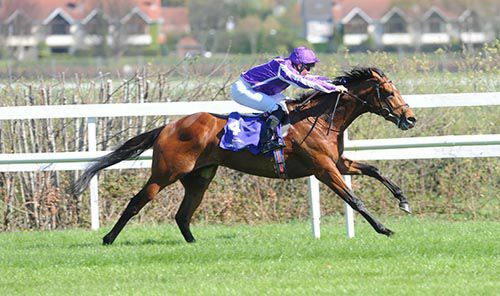 What a contrast at Leopardstown this year, it could have been a summer’s day. What a pleasant journey: the 20-minute Luas Line ride to Sandyford followed by the courtesy bus to the track. The card featured 2000 and 1000 Guineas’ trials as well as the Ballysax Stakes. Last year Harzand won the latter before winning the Derby and the Irish Derby. 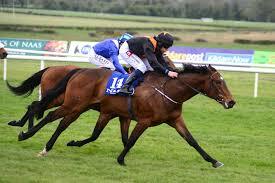 Jet Setting won the 1000 trial before going on to win the 1000 Guineas at the Curragh. Considering the potential for seeing future Classic winners, the meeting was not particularly well attended. The 2000 trial was won by Orderofthegarter – a 1-2 for AOB but what did he beat and where will he run next? AOB had four runners in the fillies’ equivalent and again was responsible for the 1-2. It was won by Hydrangea, who had finished second in four of her last six starts. In the Ballysax a family affair ensued with JOB’s Rekindling holding off his father’s three runners stacked up behind him. Unlike last year perhaps we'd not seen a Classic winner although OOTG was very impressive. I failed to back a winner all afternoon finishing with a second - Fountain - in the concluding handicap. But the punting excitement was not over yet. We took seats in one of the bars – just as we had last year at Gowran – in time to watch the National. The Last Samuri had provided my excitement in 2016 being “up in the van” most of the way before finishing a gallant second. This year I’d placed four ante-post bets at different times during the winter. Three of them were out of contention by half-way. I thought the fourth was too as he’d not been mentioned. Then suddenly One For Arthur appeared at the second last full of running! A profitable day thanks to the National and back into Dublin for dinner. It’s an expensive city with the exchange rate not what it was last year. However the best restaurants have an “early-bird” or pre-theatre menu if you don’t mind dining around 18:30. We’d planned to go to Hugo’s but on arrival found them fully booked. So we crossed the road and took a chance on “Bang” - a restaurant we’d never been to. It was very good – we sat down at 18:29 a minute before the cut-off. I had the hake which was superb. If I had a criticism it would be that it’s a bit cramped when full but the food/service is first rate. 9th April 2017: admission charges 15 euro, seniors 9 euro (inc. tea/coffee voucher), students < 25 and children < 18 - no charge. Sunday started with a 30-minute train ride from Heuston to Sallins. Again a courtesy bus met us at the station for a 10-minute transfer to the track. Just nine euro entrance charge for us, with a cup of tea or coffee thrown in. Once again here was a quality meeting, transferred from The Curragh which is undergoing redevelopment. The card included two group three races. These were both five runner affairs though and the six-furlong17-runner handicap looked the preferred betting medium! 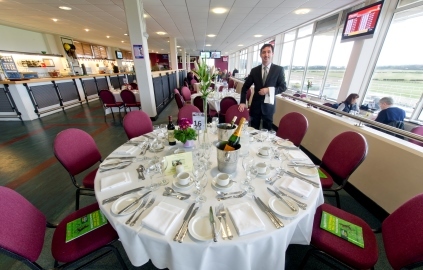 As for the facilities, the ground floor was a bit basic whereas the panoramic restaurant was top drawer with amazing views of the track. Can’t vouch for the food as we weren’t hungry enough for the three-course lunch (around 50 euro) but the set up looked impressive. One catering curiosity I couldn’t fathom at first was signs which read “Roast beef rolls available at Tote”. It wasn’t until I read the sign over the downstairs bar that it clicked: the bar is called “Tote”! Why not go the whole hog and call the tote “Bar”? Very strange. At the opening meeting here a couple of weeks back the far rail was the place to be as low drawn runners prevailed in a similar contest. However in the eight six-furlong handicaps staged here in 2016 the high numbers dominated more often than not. Plus there was a pace angle as three of the first four in the betting were drawn highest: 17, 16 and 15. Mizaah (16) had been an expensive failure (for me) here on the opening day having missed the break, but my preference this time was for Rapid Applause (17). The AOB/RLM horse (15) had been the morning favourite but had weakened considerably in the market. So Rapid Applause (9/1) to win with Mizaah in a reverse forecast. Incredibly, that's what happened. The draw positions of the first six home were: 17, 16, 14, 9, 12, and 13 (17 ran). Back at Heuston we took a taxi to Searson's for their Sunday evening jazz (17:30 - 20:30). The repertoire style was Mack the Knife/Summertime etc. Great accompaniment for king prawns, Atlantic salmon and asparagus, washed down with several pints of Guinness. It was all over too soon; what's more the weather had turned. Despite the weekend's financial success we wearily made our separate ways back to our hotels in the pouring rain. Next up though it’ll be summer time and the Galway Festival!